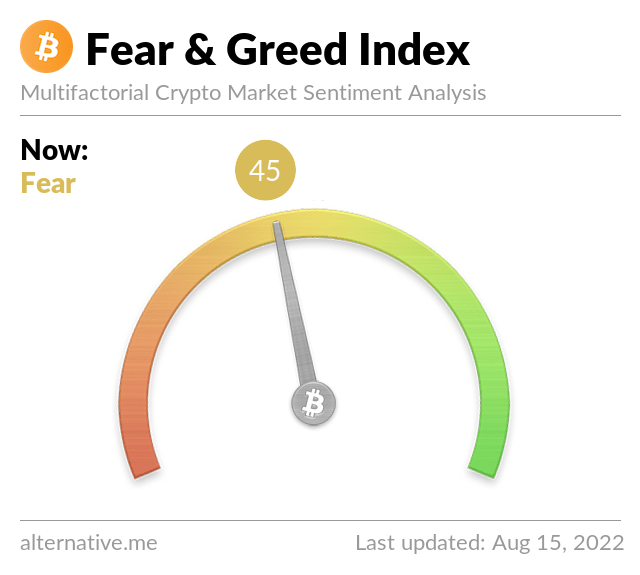 Each day, we analyze emotions and sentiments from different sources and crunch them into one simple number: The Fear & Greed Index for Bitcoin and other large cryptocurrencies. Here is a plot of our Fear & Greed Index over time, where a value of 0 means "Extreme Fear" while a value of 100 represents "Extreme Greed". Since we started measuring the Fear & Greed Index with our final algorithm (small changes excluded) in early 2018, there is no older data available than Feb 01, 2018. We had an issue with different timezones on our update system, and therefore, in the week from Feb 13, 2019 to Feb 21, 2019, the daily calculated values overlapped to multiple days. Since we do not access the database to change past values, please keep that in mind when analyzing the history data. Why Measure Fear and Greed? Extreme fear can be a sign that investors are too worried. That could be a buying opportunity. When Investors are getting too greedy, that means the market is due for a correction. Therefore, we analyze the current sentiment of the Bitcoin market and crunch the numbers into a simple meter from 0 to 100. Zero means "Extreme Fear", while 100 means "Extreme Greed". See below for futher information on our data sources. We are gathering data from the five following sources. Each data point is valued the same as the day before in order to visualize a meaningful progress in sentiment change of the crypto market. First of all, the current index is for bitcoin only (we offer separate indices for large alt coins soon), because a big part of it is the volatility of the coin price. We’re measuring the current volatility and max. drawdowns of bitcoin and compare it with the corresponding average values of the last 30 days and 90 days. We argue that an unusual rise in volatility is a sign of a fearful market. Also, we’re measuring the current volume and market momentum (again in comparison with the last 30/90 day average values) and put those two values together. Generally, when we see high buying volumes in a positive market on a daily basis, we conclude that the market acts overly greedy / too bullish. While our reddit sentiment analysis is still not in the live index (we’re still experimenting some market-related key words in the text processing algorithm), our twitter analysis is running. There, we gather and count posts on various hashtags for each coin (publicly, we show only those for Bitcoin) and check how fast and how many interactions they receive in certain time frames). A unusual high interaction rate results in a grown public interest in the coin and in our eyes, corresponds to a greedy market behaviour. Together with strawpoll.com (disclaimer: we own this site, too), quite a large public polling platform, we’re conducting weekly crypto polls and ask people how they see the market. Usually, we’re seeing 2,000 - 3,000 votes on each poll, so we do get a picture of the sentiment of a group of crypto investors. We don’t give those results too much attention, but it was quite useful in the beginning of our studies. You can see some recent results here. The dominance of a coin resembles the market cap share of the whole crypto market. Especially for Bitcoin, we think that a rise in Bitcoin dominance is caused by a fear of (and thus a reduction of) too speculative alt-coin investments, since Bitcoin is becoming more and more the safe haven of crypto. On the other side, when Bitcoin dominance shrinks, people are getting more greedy by investing in more risky alt-coins, dreaming of their chance in next big bull run. Anyhow, analyzing the dominance for a coin other than Bitcoin, you could argue the other way round, since more interest in an alt-coin may conclude a bullish/greedy behaviour for that specific coin. We pull Google Trends data for various Bitcoin related search queries and crunch those numbers, especially the change of search volumes as well as recommended other currently popular searches. For example, if you check Google Trends for "Bitcoin", you can’t get much information from the search volume. But currently, you can see that there is currently a +1,550% rise of the query „bitcoin price manipulation“ in the box of related search queries (as of 05/29/2018). This is clearly a sign of fear in the market, and we use that for our index. 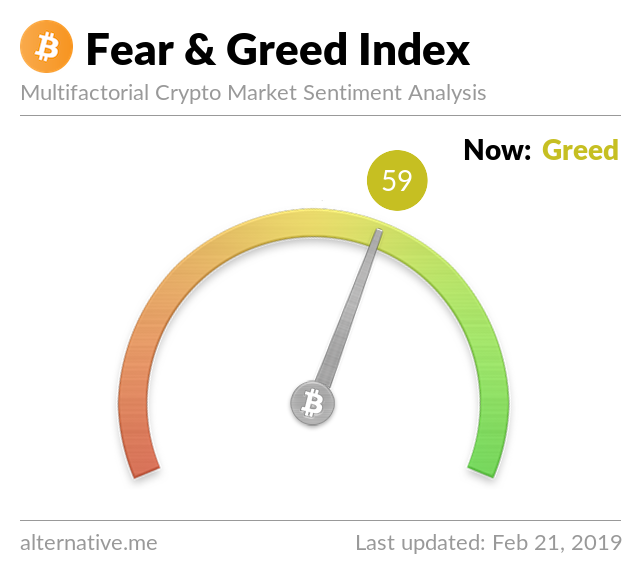 Description: Get the latest data of the Fear and Greed Index. limit, [int]: Limit the number of returned results. The default value is 1, use '0' for all available data. Please note that the field "time_until_update" will only be returned for the latest value. format, [string]: Choose to either receive the data part formatted as regular JSON or formatted as CSV for easy pasting in spreadsheets, use either 'json' or 'csv' respectively. * The information provided on this website does not constitute investment advice, financial advice, trading advice, or any other sort of advice and you should not treat any of the website's content as such. Alternative.me does not recommend that any cryptocurrency should be bought, sold, or held by you. Do conduct your own due diligence and consult your financial advisor before making any investment decisions. Currently we connected 8247 items.